Fans of tower defense-like titles should check out Lumberwhack: Defend the Wild, a game which pits your animal forces against an ever-growing gang of pissed off lumberjacks. The loggers are encroaching on your animal territory, and it is your duty as a monkey to group your forces, not allowing the humans to cut down your beautiful forest home. 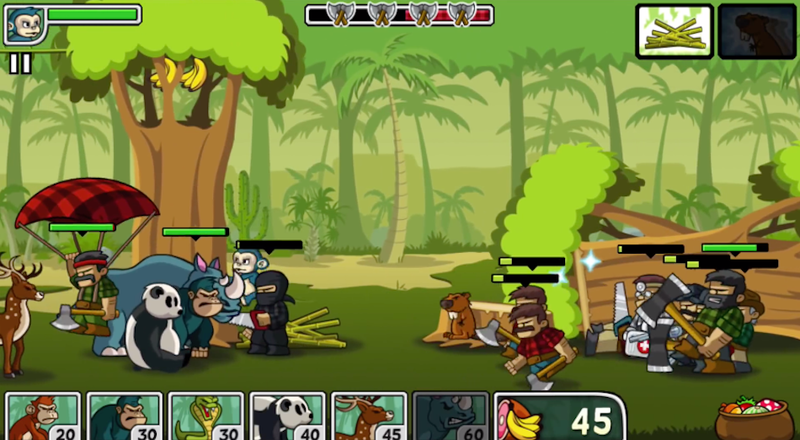 The game plays much like Plants Vs. Zombies – continuous waves of lumberjacks and ninja loggers come piling down into your forest, and you must used upgraded tigers, gorillas, and other various jungle creatures to battle them. The graphics are decent, and gameplay is fluid. As mentioned, if you dig tower defense games, this title should do the trick for you. The game is free to download, however, you will see a few IAPs to help you progress quicker.